Fresh figs are easily the most underrated fruit that’s readily available in the States. Maybe people don’t realize they exist because the season is ridiculously short – a window of maybe two weeks at the end of summer – but I get ridiculously excited when I see these start popping up at grocery stores! My sweet aunt knows I love them too, so last week she brought over several baskets of tiny black mission figs. Of course this was right after I bought the Costco pack of Turkish figs myself, so my diet has consisted of mostly figs lately. I’m okay with that. I had big dreams for all the things I could make with them, but to be honest I mostly enjoy eating them plain. That said, there is so much potential for using figs in cooking and baking (outside of what Americans typically associate with figs… Fig Newtons. Please. *eyeroll*) For the sake of showing how simple, beautiful, and delicious it can be to incorporate these little treasures into your weekly menu, I pulled together this combination for a quick lunch. 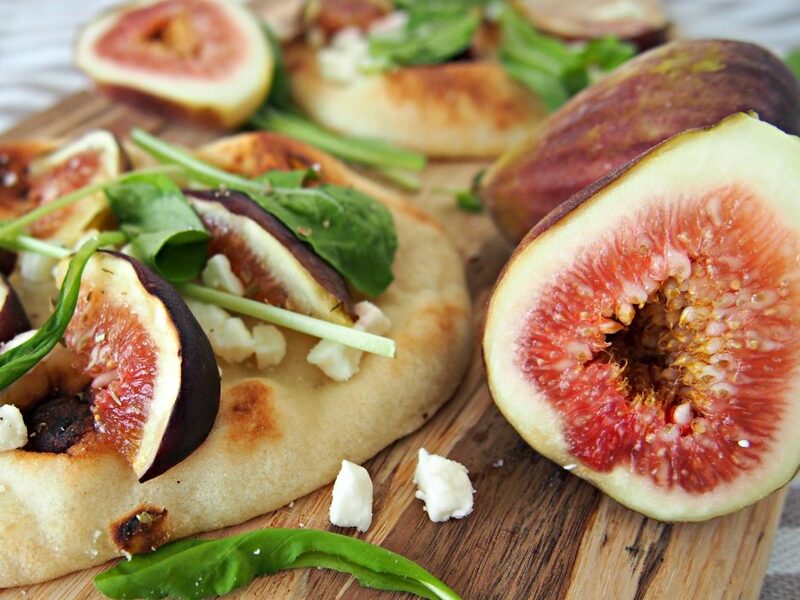 You can use any kind of fig for this recipe. It’s actually hard for me to even write a recipe because you can literally use however much you want of every ingredient! I’m living by myself this summer, so I used these mini naan flatbreads (found at Costco) because that’s what I had and could finish in a meal. You could easily serve this as an appetizer for a crowd by cutting full-size flatbreads into strips. I’ve already made a fig banana smoothie, fig and vanilla challah french toast, this flatbread, and some sort of tart or cheesecake with figs is on my radar. 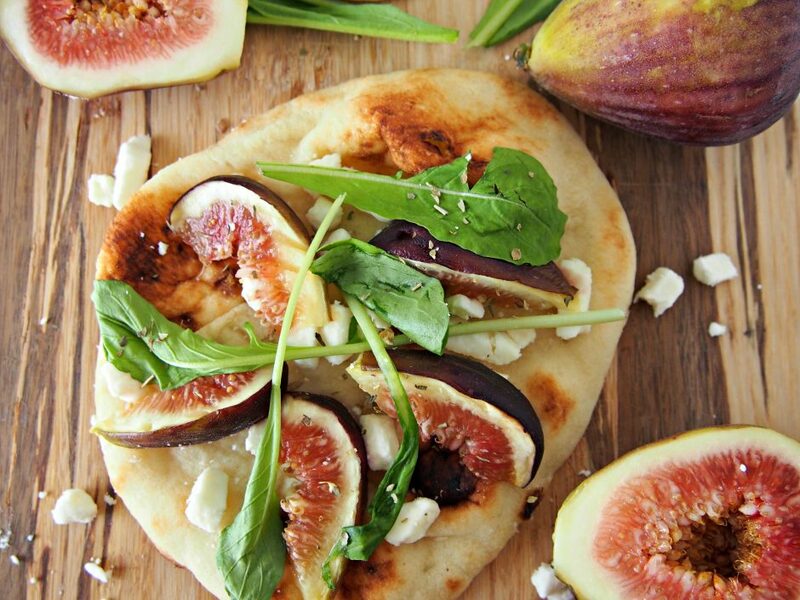 What are your favorite ways to enjoy fresh figs when they’re in season? Preheat toaster oven to 350. Line the baking pan with aluminum foil and place the flatbreads on the foil. Brush lightly with olive oil - this is just to make the toppings stick. 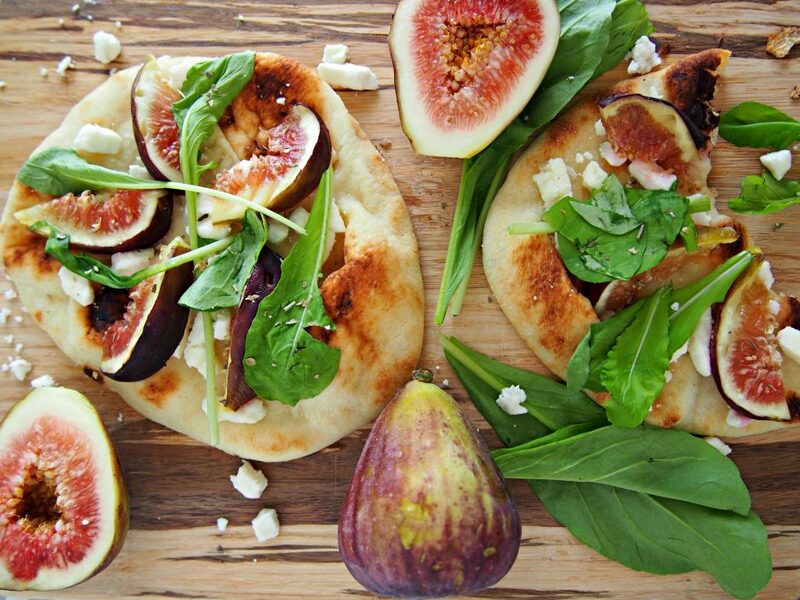 Sprinkle goat cheese on each flatbread - a little goes a long way in terms of flavor! Slice the figs into thin wedges and arrange them however you like on each flatbread - I did it in a star/flower shape with the wedges facing the same way. You might not use both figs fully. Top with arugula -this will wilt in the oven, so it doesn't matter what it looks like. Once they're ready, pop them in the toaster oven on the broil setting for 4-6 minutes, or until the cheese is melty and the figs just barely have a golden tint. Serve immediately!